Ministry troubles can come from a number of sources but when we put the focus on God’s character and ways, we find perspective, peace, and encouragement. God gives us the wisdom, power, and grace we need to get beyond where we are to start anew. Feeling unfulfilled in ministry? Perhaps you need to re-examine if you’re using the spiritual gifts God has given you. You may need to push the restart button to serve in ways that better fit His intent for you. Take time to pray for the power and grace to line up with your best fit in ministry. In a rut? If ministry has become a bit lackluster, you may need to push the restart button to refocus and rediscover the joy of serving. Trust in the Lord for renewed strength to break out of your rut and soar again with a new song in your heart. Seek God’s grace to not give in to the temptation to stay where you are. Struggling with feeling insignificant in a behind-the-scenes ministry? You may need to push the restart button for an attitude adjustment. Ask God for the strength to keep from comparing yourself to what others are doing. Pray God gives you the grace to find your significance in Him and to be content in what you do. All Spiritual Gifts as Needed as Others? 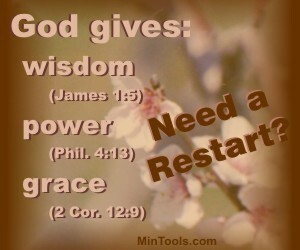 No matter the issue, God has the wisdom, power, and grace you need for a restart. He truly is a God of new beginnings so “Trust in the LORD with all your heart and lean not on your own understanding; in all your ways submit to him, and he will make your paths straight” (Prov. 3:5-6). Previously we looked at how it is possible to persevere in ministry if we’re pulling on the right source to sustain and strengthen us. If you’re struggling to persevere, take time to reflect on the following promises. Consider memorizing at least one verse that seems to most encourage you so you are able to recall it during moments of distress or discouragement. Bible Verses about God strengthening us, enabling us to persevere in ministry. We’ve already looked at how ministry perseverance is the staying power to keep serving with patient endurance no matter what difficulties we face. We have so many things that can come against us in ministry that could bring discouragement, frustration, fear, stress, or a general sense of being overwhelmed. We might express these feelings through bad attitudes. We might want to quit. When that happens, ministry loses its effectiveness as we’re no longer doing ministry God’s way. Because our settings vary, as well as the people we serve, we can’t begin to provide an exhaustive list of troubles we might face in ministry. What feels like a hardship to one person might seem insignificant to the next because of our different personalities, giftedness, backgrounds, training, and so forth. Prevention is Best but Not Always Possible – Then What? Everybody makes mistakes. — How about a little grace? So much can come against us as we serve the Lord. How are we supposed to persevere? To be sure, some people will outwardly keep going by sheer will, perhaps feeling too guilty or ashamed to quit. But, inwardly they’ve given in to the frustration and despair. God, however, wants so much more for us as His servants. He instructs us, “Never be lacking in zeal, but keep your spiritual fervor, serving the Lord. Be joyful in hope, patient in affliction, faithful in prayer” (Rom. 12:11-12). 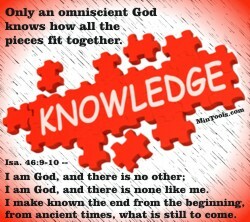 Only an eternal, omnipresent God will always be there. Only a great and almighty God will be strong enough to uphold and deliver us. Only a faithful God will stay true to us, even when we’re faithless (2 Tim. 2:13). Only a holy God can be trusted to be right all the time. Only a sovereign, omniscient God can give us the perspective we need. Because God is . . .
We can look at Moses of the Old Testament for an example. God called him to lead an impatient and stubborn group of people through the harsh conditions of a wilderness journey. Though wanting to give up on numerous occasions, we read that “he persevered because he saw him who is invisible” (Heb. 11:27). This is the kind of faith we need to persevere, not one that looks only at what we can see but one that focuses on our invisible yet very powerful and compassionate God. If we’re going to persevere, we must look to God for what we need — perspective, peace, encouragement, big picture, joy. Only when we let go and let God provide what we need, will we truly persevere, not just outwardly but inwardly as well. We must release our own expectations and look to God for the perspective we need. We must relinquish our need to strive to persevere and pull on the means God put in place to encourage us. We must refuse to cave in to our own narrow-minded views and focus on God’s big picture. We must reject our own illusion of a right to happiness and accept God’s offer of true joy that’s not based on circumstances or other people. Not Finding Much Joy in Ministry? Ministry Blues? Reflecting on an Eternal God will Help! When we start talking about the need to persevere in ministry, it implies something isn’t quite going right. Let’s be honest, we tend to want God to make ministry easy, convenient, comfortable, and problem-free. Yet, God never promised perfect circumstances. 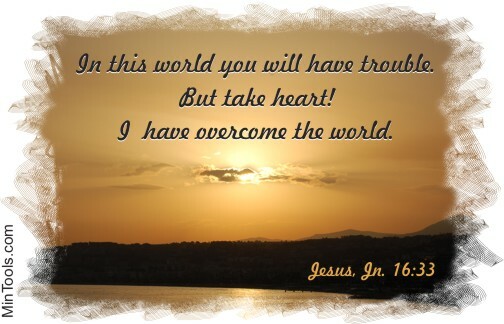 Jesus told us to expect problems in this world (Jn. 16:33). In an upcoming post we’ll look at some of the troubles we can expect in ministry. (Subscribe to be notified of new posts.) To be overcomers in ministry, we need to learn to persevere. The word for perseverance in the New Testament Greek, hypomone, comes from the word “hupo” meaning under, and “meno” meaning to abide or remain. So, the literal definition of perseverance is remaining under. That’s staying power — patient endurance and steadfastness. In short, ministry perseverance deals with being sustained and strengthened to keep serving no matter what we face or how we feel. He found God’s grace to be sufficient in His weaknesses (2 Cor. 12:9-10). Persevering isn’t the end goal. 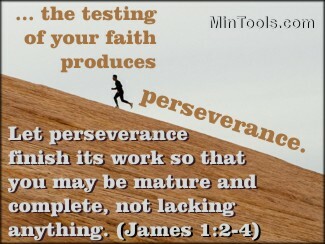 God intends for much more to follow perseverance as James reminds us to “Let perseverance finish its work so that you may be mature and complete, not lacking anything” (James 1:2-4). – Perseverance builds character (Rom. 5:3-4) such as godliness, brotherly kindness, and love (2 Pet. 1:5-7). When we view the hardships and difficulties in ministry through this lens, we see that perseverance isn’t just about hanging in there and surviving but rather thriving. Ministry doesn’t always go as expected. Parenting doesn’t always produce the results you hoped for. Relationships don’t always go smoothly. These examples will not cover everything you might face. And, the root cause in these various situations could be different in your case. A ministry event or class didn’t go well. Surface: It was a bad idea so I won’t do that again. Root: Perhaps you didn’t invest sufficient time into planning and/or praying. Solution: Learn to set priorities, to better manage your time, and be prepared. Always pray. People are getting disillusioned with serving in the Church. Surface: They don’t love the Lord as they should so we’ll teach/preach more to build their faith and love. 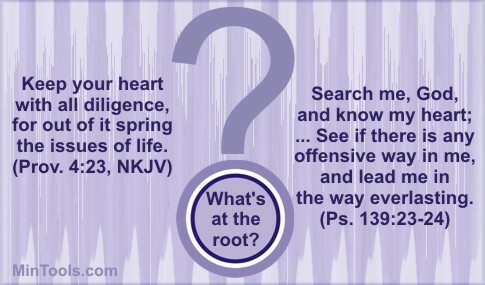 Root: Maybe people aren’t doing what lines up with their spiritual gifting, passions, and personality. Solution: Help people find their best fit in ministry. Children don’t sit still and pay attention to the Bible lesson. Surface: Kids are so disrespectful today so I will have to discipline them more. Root: Possibly you aren’t teaching in accordance with their age level developmental need for activity. Solution: Use more hands-on Bible learning activities. God doesn’t seem to be answering your prayers. Surface: God doesn’t care so it doesn’t matter if I pray. Root: Maybe you aren’t praying in keeping with God’s character or will. Solution: Learn more about God and His Word. Some people in your church who claim to be Christians aren’t safe to around. Surface: They don’t belong here so we’ll be more protective until they leave. Root: Perhaps people haven’t been discipled as they should. Solution: Follow the Great Commission to its fullest extent which takes people beyond getting saved to spiritually growing and obeying Him as Lord of their lives. People are so busy and it’s affecting recruitment and the fulfillment of Body Life as God designed it. Surface: People aren’t putting God first so we’ll teach/preach more about prioritizing God and His will. Root: Possibly they don’t have good role models of how to live in ways that prioritize what’s most important. Solution: Begin with yourself and your church to control your schedule so it is more purposeful and considerate. Your child keeps falling back into the same bad behavior even though you keep disciplining. Surface: I’m not being hard enough on him/her so I’ll enforce stricter consequences. Root: Maybe the child is harboring resentment, hurts, or anger. Solution: Focus on the heart, not just the behavior. Whatever the circumstance, ask God to get you beyond the surface to the root cause. Continue to pray about it to determine the best course of action based on the real issue. Look for resources that can help you learn and grow in this area.